Car manufacturers (and fuel retailers) are concerned about a new blend of eco-friendly diesel in France. 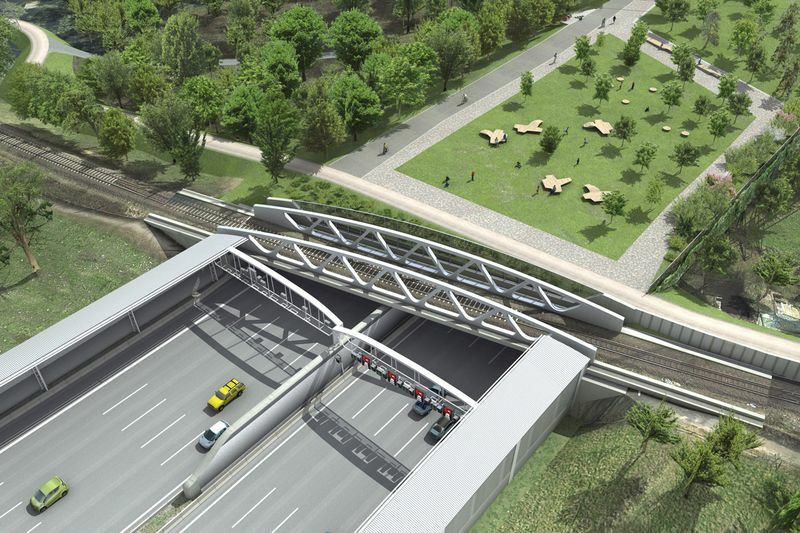 Also, Hamburg will open the first stage of its A7-covering Deckel project later this year. Costs have doubled on Prague’s still un-opened Blanka Tunnel Complex. Diesel dips below €1/l again in Luxembourg. Attempted bribery see drink driver arrested in Latvia. Not suitable for all engines, may increase costs and fragment market say car manufacturers and fuel retailers. 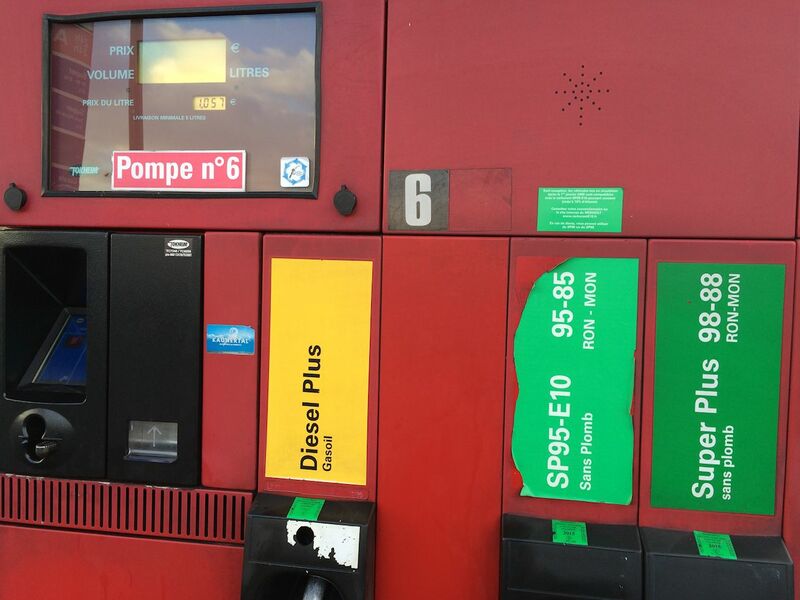 Fuel pumps France, December 2014, photo @DriveEurope. Label on unleaded 95 petrol includes E10 to reflect bioethanol content of 10%. Diesel pumps should also be clearly labelled says ACEA and FuelEurope. European car manufacturers have raised concerns over a new blend of eco-friendly diesel allowed at French filling stations. As of 3 January, retailers in France can sell diesel with a content of 8% biodiesel (or FAME) compared to 7% now. Industry bodies – the European Automobile Manufacturers’ Association (ACEA), and FuelsEurope representing refiners and retailers – say the new diesel may not be suitable for all engines, and may lead to a fragmented fuels market in Europe. ACEA and FuelEurope previously said, if introduced, so-called B8 diesel should be clearly labelled and that B7 should still be widely available. It’s not yet clear if this will be the case. Fuel quality in Europe is currently governed by two EU directives. France is the only country, so far, to allow B8. Biodiesel is derived from vegetable oil or animal fats and significantly cuts emissions (except nitrogen oxide). However, disadvantages include, in some cases, corroding or blocking engine components. After pollution spikes in Paris and other parts of the country last year, France has been in the vanguard of discouraging the use of diesel. The new biodiesel content mirrors that of petrol which in France (and Germany) is commonly ten percent bioethanol compared to five percent in the UK and other countries. This is also unsuitable for some engines, mainly those manufactured before 2002 according to WhatCar. If in doubt, drivers should buy 98 octane petrol. In either case, pumps should be clearly labelled (see photo above). Hamburg is part way through a plan to bury the A7 motorway, to create living space on top and cut down on noise, one of a number of major cities with similar plans. Both Paris and London are considering the idea while, on a smaller scale, the southern Dutch city of Maastricht is nearing the end of its Gruner Loper (Green Ribbon) project, to bury the A2 to the east of the city centre. The A7 plan, called Hamburger Deckel (Hamburg Lid), covers three sections, for a total length of 3.5km, in suburbs just to the north of the River Elbe. The building involves lowering the road way and constructing concrete ‘lids’. It will open (or rather close) in stages from this year until 2022, and is in addition to on-going widening works. In short, the traffic disruption in Hamburg will continue for some time. Photo via City of Hamburg. roundup: CZECH REPUBLIC. Costs on the Blanka Tunnel Complex in northern Prague, the underground ring road, have risen from an initially contracted CZK21.2bn (£583m) in 2006 to nearly CZK43bn (£1.18bn) now with some – expensive – items still to add says Prague Post (and all coming from the city’s budget). It still isn’t open either. First tests were due to start in December but the first cars won’t drive the tunnel system, one of the world’s longest, until at least April. LUXEMBOURG. A rise in VAT of two percentage points on 1 January saw fuel rise temporarily above the €1/l barrier but thanks to continued low oil prices, diesel has now dipped below again says Wort.lu. As of Saturday, the nationally regulated price of derv stands at €0.984/l. Unleaded 95 is €1.079 and unleaded 98, €1.141. Luxembourg consistently has the lowest fuel prices in Western Europe. LATVIA. A drink driver in Zemgale, a suburb of capital Riga, has been arrested after attempting to bribe police with €5,000 to avoid charges says BNN-News.com, one of 97 similar incidents in the area last year. Traffic police corruption is an unfortunate fact of life in many former Communist-bloc countries of Central and Eastern Europe but the advice is always, always, always wait for police to initiate the transaction.